A PAIR of SWISS GALOPPERS Horse Hoof Boots. The SWISS GALOPPER hoof boots are Tough Wearing and Exceptional Value For Money. Helping Bring a Natural Balance Back to Your Horse or Pony! Ideal for horses with slightly longer or almost round shaped hooves. Supplied with a 1 x FREE Pair of Short Heel Gaiters. The SWISS GALOPPERS hoof boots are sold in PAIRS. Easy to apply and lightweight. 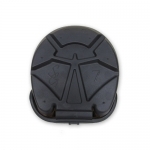 The soft components in the ball area guarantee a perfect fit. The soft bed of the innersole has a shock-absorbing effect and stops the boot from twisting on the hoof. It will provide good grip on tarmac and off-road. 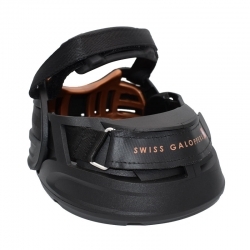 The Swiss Galoppers hoof boot is manufactured with the two-component principle and using the most cutting-edge plastic material, which displays high abrasion durability. The Swiss Galoppers features are as follows - See Additional Images! Suitable for - Horses with longer than wide hooves, and almost round hooves. Plus can be good for horses with slight flaring to their hoof angles. The Swiss Galoppers are a fabulous performance hoof boot for riding. Not recommended for wider then long hooves. The Swiss Galoppers must be carefully sized and fitted to the hoof. The horses width and length measurements must fall within the same size for this boot to fit and be successful.